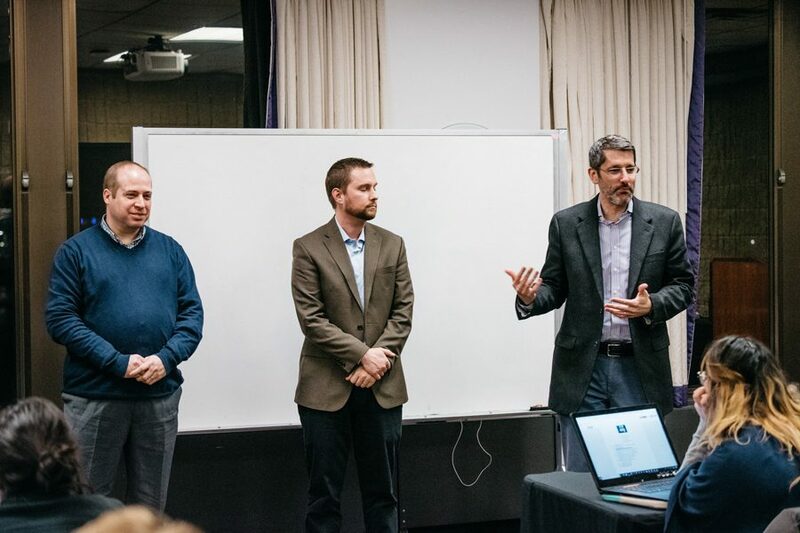 Brad Zakarin, Tim DeBold and Paul Hubinsky — members of the Undergraduate Residential Experience Committee — discuss the housing report with Associated Student Government senators Wednesday. Senators also elected two new vice presidents during their meeting. Associated Student Government senators gave feedback to members of the Undergraduate Residential Experience Committee, apportioned student organization seats for the next school year and elected two new vice presidents on Wednesday. Senators asked questions and provided comments to Brad Zakarin, Tim DeBold and Paul Hubinsky, members of the Undergraduate Residential Experience Committee who proposed changes to the University’s housing system in a January report. ASG’s vice president for campus life, Ahmad Keshk, said the changes will not go into effect next year and that the University is gathering feedback now. Hubinsky, NU’s associate director of residential life, said the newly proposed neighborhood system would maintain common spaces in residential housing and Greek houses, while offering engagement activities for everyone in each area. He said these neighborhoods could help off-campus students maintain a connection with the campus. Off-campus students would also have access to these centers with their Wildcards, said DeBold, assistant director of residential and academic initiatives. The housing report considers eliminating the non-residential fee to reduce financial barriers to inclusion in a community, he said. “(The report) is an attempt to universalize the fundamentals of the residential colleges,” DeBold said. Any residence in a neighborhood could rent space in the neighborhood engagement center, said Zakarin, director of residential and academic initiatives. Zakarin said this would take some financial and organizational burden off residential executive boards that spend a lot of time and funds trying to create smaller scale community spaces. Senators also elected two students as new vice presidents: SESP sophomore Isabel Dobbel as vice president for A-Status Finances and Weinberg sophomore Shreyas Tallamraju as vice president for B-Status Finances. Former vice president for A-Status Finances Daniel Wu said the two committees have been working on a reform to make funding more accessible for student groups. Wu said they hope to introduce a proposal about these reforms, which would fill “the cracks of the structure,” through a focus group and town hall. Their main goals are to remove the barrier between A- and B-Status groups and fund events on an individual basis, as opposed to a “student group by student group basis,” he added. “ASG funding for a student group won’t be a status — it’ll just be funding for a student organization,” the Weinberg senior said. Senate also announced the apportionment of 20 student organization seats for the 2018-2019 school year. Alianza, the Residential College Board and a coalition of the Political Union and Politics and Policy are among the newly-represented organizations. The next time to reapply is Winter Quarter 2019. Some code changes were also approved, including more specific rules about submitting legislation, and senators proposed legislation about the expansion of all-gender bathrooms and apportionment of B-Status funding. Senators will vote on the bills next Wednesday.